Strain Measurement - recently published book by IFSA Publishing is the first volume in the new Book Series 'Measurement of Physical and Chemical Quantities'. 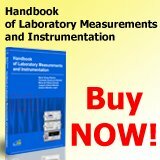 The different subjects exposed in this book are presented in a very simple and easy sequence, which makes it most adequate for engineering students, technicians and professionals, as well as for other users interested in mechanical measurements and related instrumentation. Electronic Nose: Introduction,Sensor and Application: Fundamental of Electronic Olfaction System - new book published by LAP LAMBERT Academic Publishing. For beginners as well researchers this book is a brief guide of E-nose. Signal Processing for Intelligent Sensor Systems with MATLAB® - recently published 2 edition. 1999 - 2017 Copyright ©, International Frequency Sensor Association (IFSA). All Rights Reserved.